SHANGHAI — China has given the go-ahead for several local authorities to sell bonds as it moves to bridge financing shortfalls and prevent debt defaults by overextended provincial governments. The Ministry of Finance said in a notice Thursday that Shanghai, Zhejiang and Guangdong provinces and Shenzhen, a special economic zone bordering Hong Kong, would be allowed to issue three-year and five-year bonds on a trial basis, subject to quotas. China normally prohibits local governments from issuing bonds directly or from taking bank loans, confining such bonds to those issued by the central government on their behalf. Local governments owe about 10.7 trillion yuan ($1.7 trillion) in debt through financing vehicles set up mainly to support construction projects, according to Beijing. Issuing bonds would help them to honor those obligations. Stephen Green, head of Greater China research at Standard Chartered in Shanghai, estimated in July that 4 trillion yuan to 6 trillion yuan ($630 billion to $950 billion) of local government debt may not be repaid by the projects it financed. His estimate of local government borrowing is larger than the central government's, at up to 14 trillion yuan ($2.2 trillion). Instructions outlined by the finance ministry suggest there will be strict central government oversight of any bond sales by provinces. Bond quotas set for one year cannot be carried over to another, it says. Funds raised by local government bond sales will be kept in a special account of the finance ministry which will oversee payment of interest and principal. The ministry said the local governments also should provide timely information to the public regarding local economic and financial conditions. With highway and railway projects running short of cash, Zhejiang province, west of Shanghai, plans to issue 8 billion yuan ($1.3 billion) worth of bonds to fund infrastructure projects this year, according to earlier reports. 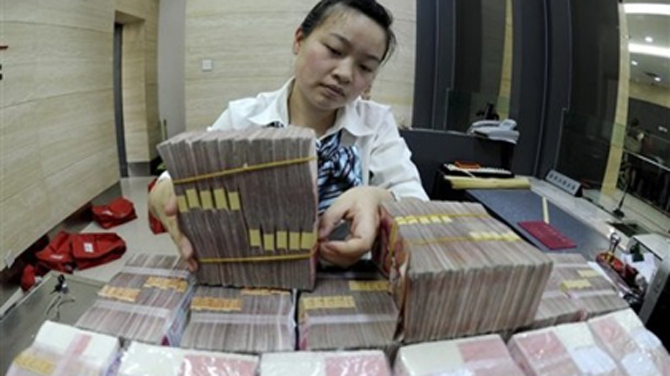 Citing local officials, the financial magazine Caixin said Shanghai plans to issue 7.1 billion yuan ($1.1 billion) in bonds and Guangdong 6.9 billion yuan ($1.08 billion). Among the projects such bonds are meant to support are an inter-city rail construction in Guangdong's Pearl River Delta region and housing projects, environmental improvements and social welfare and educational facilities in Shanghai, it said. So-called "affordable housing" projects are a top priority for cities ordered to expand such programs but lacking the financial wherewithal to follow through. China's banks, its Railway Ministry and many corporations are seeking to raise money by issuing bonds as liquidity has tightened and share markets remain weak. To help entice wary investors, the government recently halved the tax on interest from railway bonds and designated them as government-backed bonds, rather than corporate bonds. On Wednesday, China's top banking regulator acknowledged concerns over massive local debts and potential ripple effects from failing informal lending networks in some regions. But Liu Mingkang, chairman of the China Banking Regulatory Commission, said the "overall risks are controllable." The government has ordered banks to relax repayment terms and loosen credit for small and medium-size companies most severely affected by curbs on lending meant to help cool inflation. Liu promised strict controls on local government borrowing and greater transparency regarding spending. "It is undeniable that local government financing platforms have not been prudently managed. A lack of monitoring mechanisms and other problems have created a number of risks," he said. China's total public sector debt remains at 50 percent, below the conventional warning level of 60 percent and well below levels in the U.S. and Europe, Liu said. "Risk exposure has been effectively curbed," he said. Associated Press researcher Yu Bing in Beijing contributed to this story.